The Mile of Murals is a community-based public art initiative in the Rogers Park neighborhood of Chicago, located on the far north side of the city. Click HERE for the map of the area. The project began in 2007, with the intention to nurture, promote, and celebrate the arts-centered identity of Rogers Park. Over the last six years, the Mile of Murals has commissioned ten beautiful large-scale works, consisting of five block-long pieces, three viaducts, and one overpass: totaling of over 14,000 sq feet of painted walls. Our ten-year project goal is to paint a full mile of murals along the CTA Red Line track from Estes Avenue to Pratt Boulevard along the Glenwood Avenue train line. The project will result in 19 large-scale murals: ten block-long walls, seven viaduct walls, and two overpasses. New artists and themes are selected annually through a rigorous selection process juried by arts professionals and community leaders. 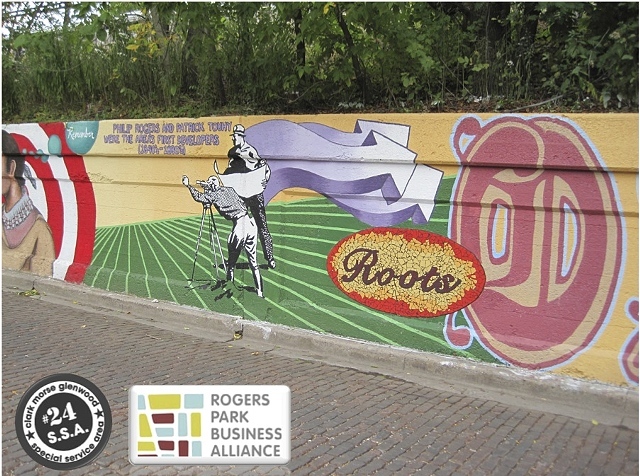 Mile of Murals is proudly sponsored by the Rogers Park Business Alliance and the Clark/Morse/Glenwood Special Service Area (SSA#24). The Mile of Murals Committee is updating their plans to complete the remaining walls and maintenance of existing walls. In 2018 they will be working to ensure the protection and preservation of existing murals and doing some repairs and maintenance work. If you are an artist and you are interested in being included in future RFPs or would like to submit a proposal for future walls please complete the qualification form below. Please be in touch with any questions or comments; email us at abermudez@rpba.org or info@mileofmurals.com.